In celebration, they are offering a free dessert with the purchase of any meal (business lunch not included). Valid only at this branch. For more information or to see their menu, go to their web site. Recently the rabbanut has had a lot of complaints regarding the food stands in gas stations and the like, where bakery products and/or sandwiches are sold and can be heated up. There can be several kashrut issues with these stands- mixing meat and dairy, the need of a mashgiach, and whether these products have hashgacha whatsoever. The rabbanut reminds the public to look for a valid kashrut certificate in each place that you desire to purchase food. The butcher shop “Super Of” in Kiryat Gat was caught during its last inspection selling unidentified meat that was under suspicion of being treif that was brought in from the Palestinian Authority illegally. The Pitzuach unit dealt with the illegal import of meat and their kashrut certification was taken away immediately. Despite that, they are still advertising that their meat is kashered under supervision of the Jerusalem rabbinate which is false. Balkan Bakery’s חישוקי גבינה are falsely labelled as pareve. They are in fact dairy. The manufacturer is claiming that the products labelled as pareve are forgeries, and the public is asked to check the kashrut symbol on the inside of the package to confirm that it matches the symbol on the outside. Inside the package of some Brunch & Crunch mushroom blintzes (pareve) are actually cheese blintzes (dairy). Please be aware of the possible error and act accordingly. The Orchiada restaurant in Eilat is no longer under kashrut supervision. The rabbanut warns people who plan to eat aboard a tourist yacht in Eilat that there has been several instances of false advertising that the food is under kashrut supervision. The public is reminded not to accept a photocopied kashrut certificate. The public is warned of the presence of insects in dried garlic and is asked to peel and wash garlic before using and to refrain from using whole heads of garlic. The public is warned of the presence of two types of Stella Artois beer on the market- one with kashrut certification and one without. Make sure to check the label before purchasing. The Egged restaurant for its drivers in the Tel Aviv bus station is not under any kashrut supervision despite signs stating it as such. Egged drivers that keep kosher are warned to refrain from eating at that restaurant. For pictures and more information, click here. Click on the picture to go to the Facebook page where you can have the coupon sent by email or SMS. You don’t need to print it if you use the SMS. Also valid at Shufersal Online. Remember, you must sign in on Super-pharm’s web site or use their app for iPhone or Android to get the coupons. On the application you can pick the coupons you want, put them in your “basket” and have them scanned at the checkout- no printing required. These coupons cannot be used online- they must be printed and handed in. To print the coupons click on the pictures or go to Shufersal’s Facebook page. These coupons must be printed. Click on the coupon to print it here or you can go to Ace’s Facebook page. Go to the Resultz web site, put in your contact information, and get a 20% off coupon for Resultz. Expires 31 Dec 2013. Print this coupon from Dr. Fischer for a spray that kills lice and eggs in 10 minutes! Expires 31 Dec 2013. Nature’s Path has announced that their Heritage Flakes cereal has a label in Hebrew that says that the product is gluten free when in fact it is not. If you have celiac disease, you should not eat this product. You can return it to the store for a refund or you can contact EcoGreen at www.ecogreen.co.il info@ecogreen.co.il 1-800-311-355 to receive a replacement product. People who do not have celiac disease can eat this product without hesitation. I received a question from a reader about using coupons without a printer. When shopping online, you just type in the code on the coupon when ordering. Not all coupons are valid for online shopping, but it can’t hurt to type it in and try. Some coupons are sent by SMS and have a code, for example the Shufersal- Strauss deals. A few stores allow you to show the coupon on your smartphone and they will scan the bar code from there. I have seen it done at Shufersal Deal. I don’t know if it would work, but if you are too intimidated to ask the cashier to scan it, you can try it out on the self check-out lines. Unfortunately, as has been reported in the past, not all supermarkets in a chain behave the same way and not all cashiers within a supermarket behave the same way. It can’t hurt to ask and ask again. I will try and note in the future which coupons can be used without printing. If anyone has any more tips, I would be happy to post them. Thanks for writing in! 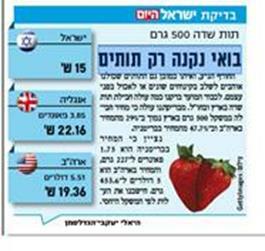 500 grams of strawberries costs 15 shekels, in Israel, 22.16 shekels in England, and 19.36 shekels in the US. Which one tastes the best? I will leave that for you to decide. How much does it cost to be vegan in Israel?